OAR’s “Autism Sibling Support” initiative offers guidance for young children, teenagers, and parents on how to productively address the ups and downs that may arise for individuals who have a brother or sister with autism. We recognized that these future advocates, potential caretakers, and lifelong friends require more support and attention. Many people who have siblings with autism are faced with overwhelming challenges, responsibilities, and emotions when addressing their siblings’ needs, well before they’re able to develop the coping strategies that their parents use. The Autism Sibling Support resources not only validate siblings’ feelings and provide a sense of comfort in knowing that they are not alone, but also offer practical and age-appropriate guidance on how to address some of the difficulties they’re likely to experience. We have produced three resources, each with a different audience. All three resources are available as a PDF document and in hard copy. Brothers, Sisters, and Autism: A Parent’s Guide to Supporting Siblings outlines what mothers and fathers can do to support children who do not have an autism diagnosis. The topics range from dealing with perceived discrepancies fairly to facilitating a positive relationship between siblings. It can be read from start to finish or used as a reference tool to troubleshoot problems as they arise. Life as an Autism Sibling: A Guide for Teens is written in a Q&A format. It addresses the challenges that teenage siblings might face as a result of having a brother or sister with autism, while also providing tips and advice on how to deal with such challenges in productive ways. The resource includes testimonials from real teenage siblings and parents, which helps make it a relatable and authentic read. 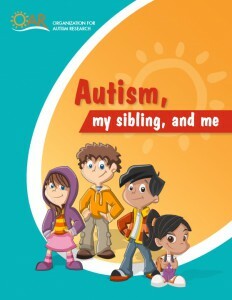 Autism, My Sibling, and Me is a colorful workbook specifically designed to engage young children. A host of cartoon characters accompany children as they learn about what autism means for their brother or sister. The resource also aims to guide young siblings through any autism-related questions and concerns they may have, offering fun ideas for activities that can help them deal with potentially stressful issues.